What am I doing at Impact Hub Accra? For the past 2 months I have been based at Impact Hub Accra, Ghana. While based at Impact Hub Accra I have been assisting the team with business development as part of my internship responsibilities. My research, meanwhile, focuses on the role that the hub plays in facilitating the pathway of local entrepreneurs. In this post, I will explain what both my internship responsibilities and research tasks involve. Business Development: how can the hub grow from strength to strength? 3 days a week I assist the CEO and cofounder of Impact Hub Accra with business development and partnership opportunities. This includes drafting concept notes and proposals for grant and funding applications. I regularly engage with potential local and international partners of the hub, to develop new programmes. I also work with existing partners to increase the resources and capacity of Impact Hub Accra. I am currently helping the hub build international partnerships by seeking opportunities to connect and share information, ideas and resources. Later this month, I will be helping Impact Hub Accra with two events at the Enterprise Africa Summit, a unique event in Accra which will bring together key stakeholders and actors in the entrepreneurial ecosystem from Ghana and beyond. Research: how does the hub assist entrepreneurs? My research focuses on how Impact Hub Accra facilitates the pathways of local entrepreneurs. Why do people come and work at the hub? What is the most attractive feature of the hub and how can the hub improve? These are just some of the questions I am trying to answer during my time here. For my research I use multiple avenues to try and capture relevant and insightful data that will help me write my thesis. I conduct anywhere between 2 to 4 interviews per week, in which I spend about an hour with members of the hub. During these sessions I conduct semi-structured interviews, profiling the members of the hub and probing them to collect their views and opinions on why the hub ‘works’. My interviews are accompanied by large amounts of participatory and observational research. As I am based at the hub 5 days a week over a total of 3 months, I have the unique chance to get involved in as many events as possible. Furthermore, working on the hub on a daily basis allows me to interact with members and the team on an informal basis as well as pick up on nuanced observations. Not a day goes by without me making some sort of observational record in one of my many research ‘notebooks’. So far, my time at the hub has allowed me not only to develop my research skills, but also a range of professional strengths. Working in a local team, experiencing the ins and outs of the industry and seeing firsthand what opportunities and challenges exist in this context has broadened my knowledge extensively. I am confident that my time here is not only extremely valuable to my research and professional development, but has also far surpassed my expectations! 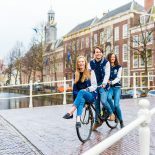 This entry was posted on March 15, 2017 by admin@theleidener in Practical Stuff, Student Life, Study, Travel.